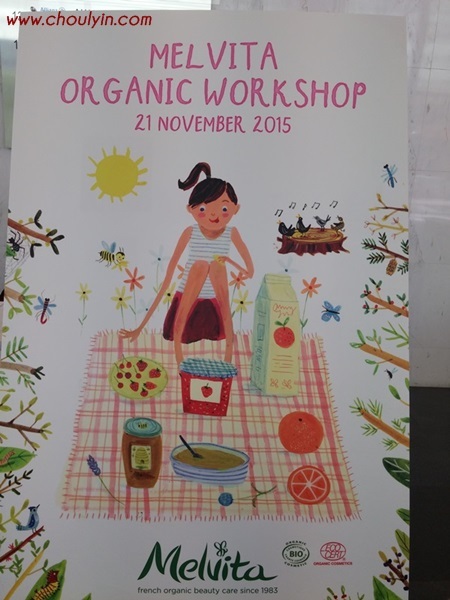 About a month plus ago, I was invited to attend the Melvita x Women's Health Organic Beauty Picnic Workshop. 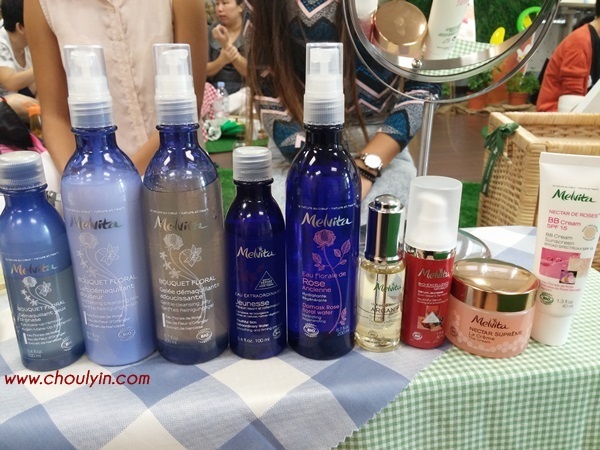 Melvita for me was not a new brand, as I have heard of it before, and read about it. But it was a product that I was not very familiar with, since I have never tried it before. So I decided, why not? There's always something new to learn about a brand, no matter how old it is. The name Melvita was derived from Honey, and Life. So in loose terms, it means honey is life. A world without bees would be a world without flowers, without fruits, without beauty. 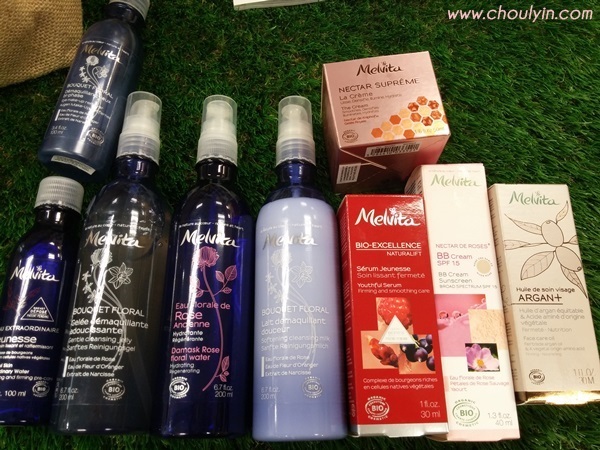 It is also, a brand that is Ecocert and Cosmebio organic certified. When I stepped foot into the Melvita/ L'Occitane office, I was blown away by the intricacies of the design. 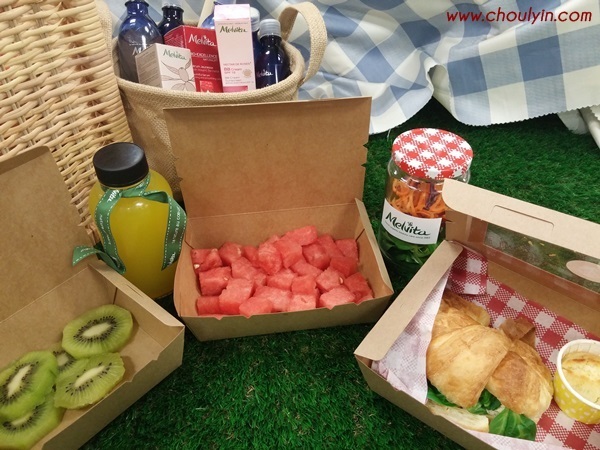 The entire conference room has been transformed into a mini picnic space. 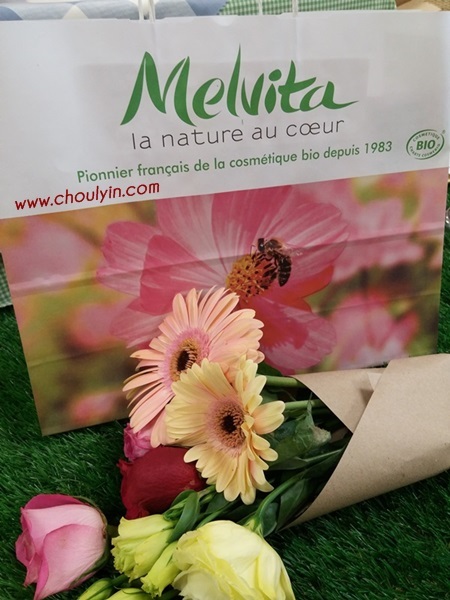 There were grass patches everywhere that served as mats for us to sit on, there were flowers decorated throughout the room, and our tables were beautifully arranged with flowers, food, drinks, and Melvita products. I love watermelons, so needless to say I just finished that! 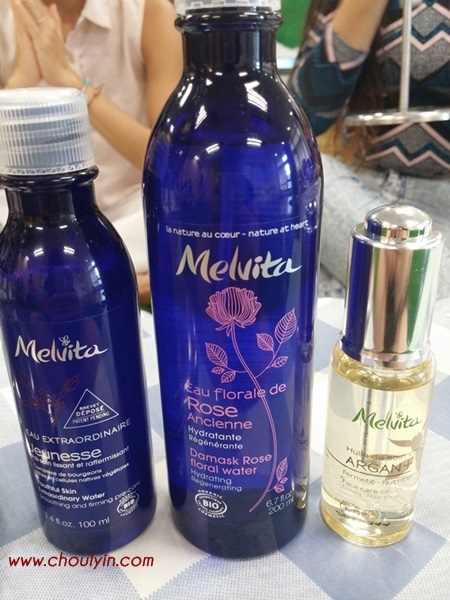 During the workshop, we were given a full range of products to try, including some of which were their newest releases. 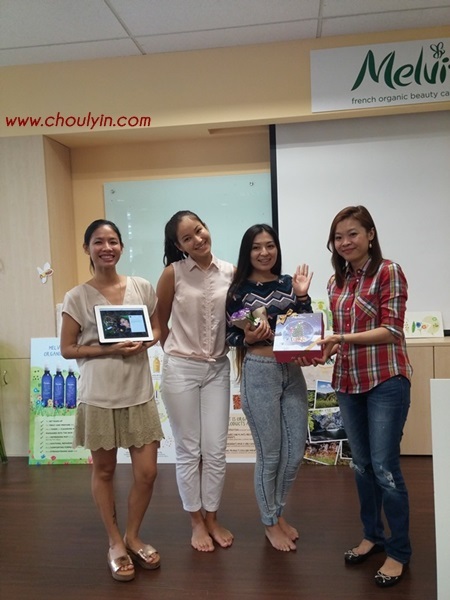 We were given the opportunity to try out and experience the products for ourselves. This was the arsenal of products we were given for our workshop. So back to the workshop, the first thing we did was to REMOVE our makeup. 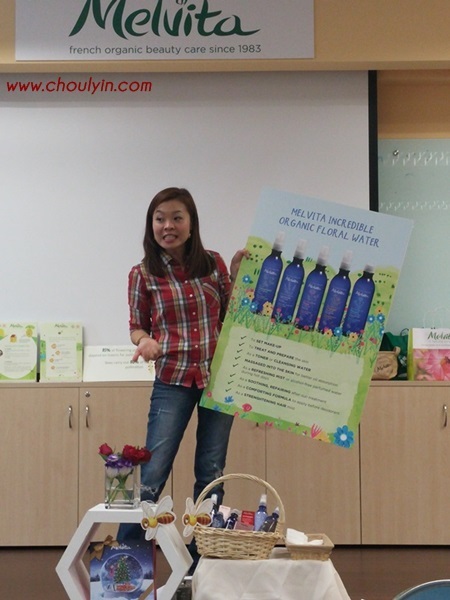 As expected, we were introduced to the double cleanse method. 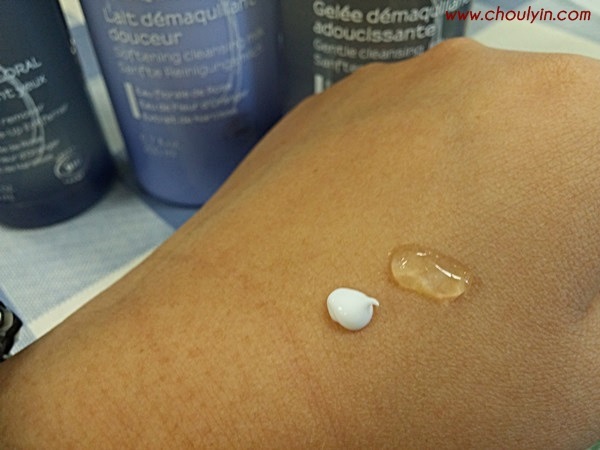 We used the Eye Make-up Remover first to remove waterproof makeup around the eyes, then to CLEANSE we used the Softening Cleansing Milk to remove all other traces of make up. Once we have removed the Cleansing Milk, we then DOUBLE CLEANSE with the Gentle Cleansing Jelly. I must say, the scent of these products are just so relaxing. 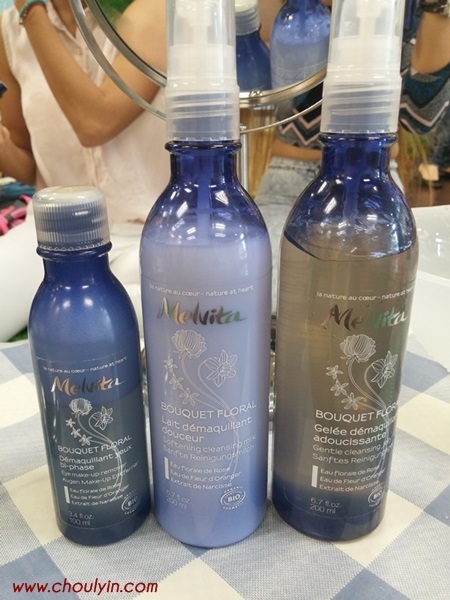 These are from the Bouquet Floral range, which includes Rose and Orange Blossom floral water and Narcissus extract. I loved the textures of the cleansing milk and cleansing jelly. It is smooth, and smells divine. Best part is? It effectively removes all the make up I had on! Next up, because we didn't have any proper place to fully cleanse our face, we were asked to spray the floral water on our faces and to cleanse it one more time. Known for cleansing impurities, this is the perfect product to use on your face if you do not have proper avenues to cleanse your face. So after cleansing, we will need to then TONE and PREP our face before starting to put on other layers of skincare on our face. 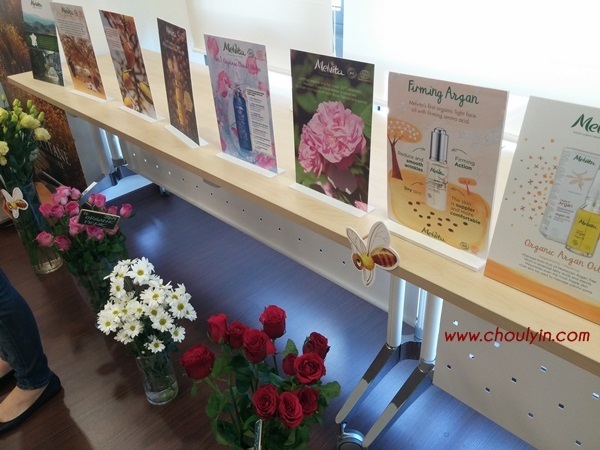 We used the Youthful Extraordinary Water to tone our face, and then patted on the Rose Floral Water once again on our face to increase absorption of the following skincare that we will be putting on. 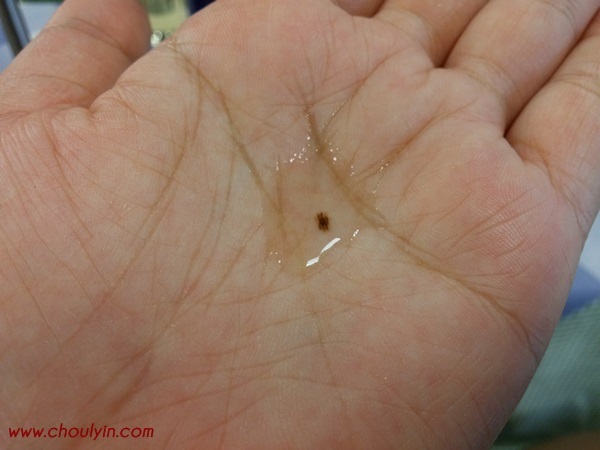 To TREAT, we added two drops of Argan Oil on our palms, warmed it in our palms, and then spread it over our face. Contrary to popular belief, if you have oily skin, putting oil on your face will not necessarily make your face even oilier. In fact, it actually retains the moisture level in your face so it is hydrated. The last three steps are to then use a SERUM, MOISTURISE, and then PROTECT. We were given the Bio-Excellence Naturalift Youthful Serum which contains a patented bud complex of beech, pine, blackcurrant, and raspberry plant extracts to fight the effects of skin ageing. 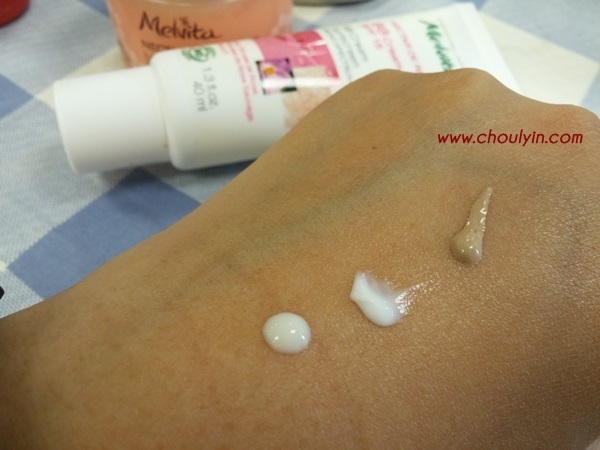 To moisturise, we were given their latest product, the Nectar Supreme La Creme. 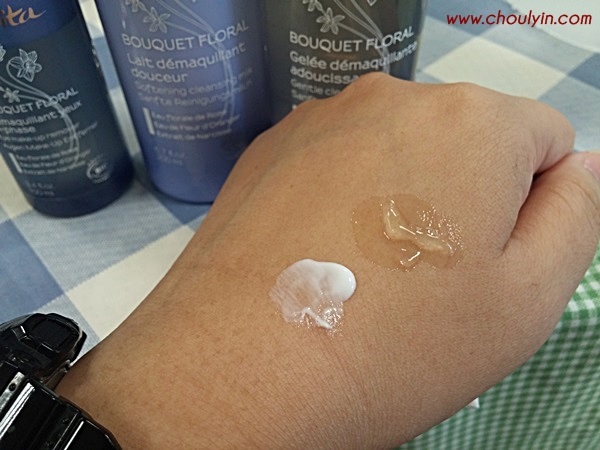 It contains a unique combination of kniphofia nectar and royal jelly, it is a very light cream, and I love its silky texture. After I applied it on my face, my skin felt very soft and it doesn't help that it has such a beautiful scent! 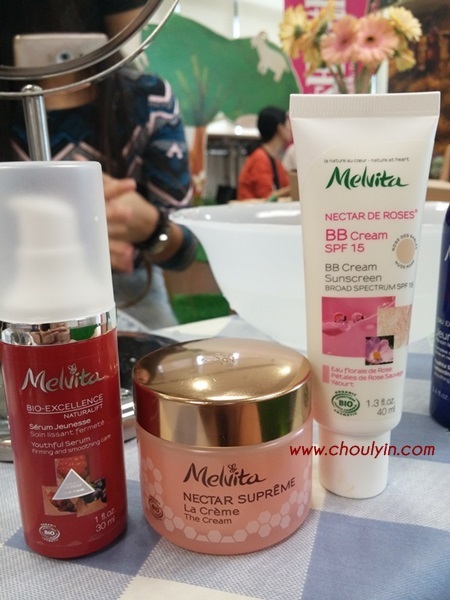 Lastly, to protect our skin, we used the Nectare de Roses BB Cream which also acts as a sunscreen with SPF15. Being a company that uses organic ingredients, there are not many colours available (in fact, I think there's only one colour!). The coverage of the BB cream is light, and I liked that it felt very lightweight on my face that I don't really feel it on my face. So there you have it, nine steps for a more beautiful and youthful looking skin! It might seem like a lot of steps, but in essence, it's really like a sandwich, and what you put on your face are like all your different condiments that you put into the sandwich. So it doesn't clog your face, but really, it enhances it. As long as you use the right products. Oh and did I mention that there was also a selfie contest happening? Well, the winner was from my picnic grass (they call it astroturf), and it was a very beautiful picture. Check it out! Quick recap on all the main points below! 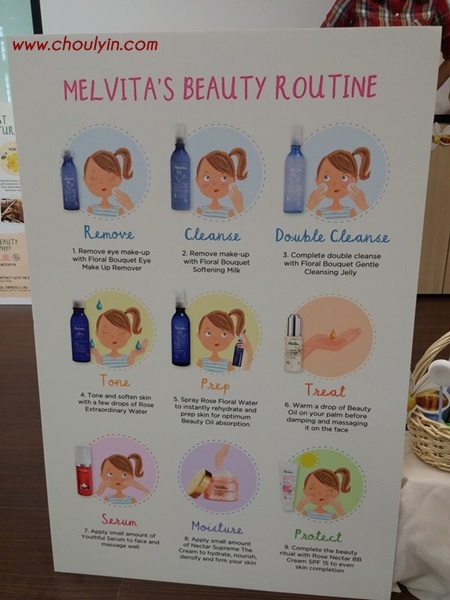 So have you tried any Melvita products yet? Do let me know in the comments section below!